The first new spice I discovered after leaving home and living on my own was cumin. It's possible my parents had some in the cupboard at home in Dallas, but I don't remember hearing about it until I was living in Austin and my housemate Risa told me that's what they put in pinto beans to make them taste so good. So I bought some and played with it. It was strong and smoky and tasted a little burnt, and a little went a long way. I hadn't yet mastered the subtle nuances of cooking with spices and tended to use equal amounts of everything without really knowing which spice was contributing which flavor. It made my beans taste too smoky, so I decided I didn't know how to make beans and pretty much stopped making them at home. But I always had cumin on hand for the occasional recipe that called for it. Fast forward to a couple of years ago when I was visiting my brother in Austin. He had cooked up a bunch of pinto beans and they were really good. I think it was a combination of they way he cooked them and the fact that, living in Chicago for many years, I hadn't had beans in a long time. They were so good, in fact, that I decided to try making them when I got back home (I recently posted about them here). What I discovered this time around is that with cumin, less is more. I started using a scant teaspoon that was gradually whittled down to about 1/2 a teaspoon. Having used cumin in some Indian cooking, I also learned to add the cumin to the onion and garlic saute before adding the beans and liquids. It made all the difference in the world. At about the same time I found a recipe in Madhur Jaffrey's World Vegetarian for a spicy eggplant stew that called for cumin seeds, so I trekked on down to The Spice House and picked some up. They had a sharper, more pungent, less smoky taste than ground cumin, and imparted a wonderful nutty flavor to the dish. From that time on, cumin (both seeds and ground) has been a staple in my kitchen. And while I now knew cumin had been around a lot longer than I had known, I never thought about how long it had been around, or wondered at the significance of its presence in Indian cuisine. When Barbara over at Tigers & Strawberries announced that the first Spice is Right challenge is Ancient Spices, the first spice that popped into my head was cinnamon. But I wanted to choose something that had some meaning to me, so I decided to do some research. And one of the first spices I encountered in my search was cumin. I was surprised to learn that cumin has been around for a long time. According to The World's Healthiest Foods, it has been developed in the Middle East, India, China and Metiterranean countries for milennia, and was used in ancient Egypt for embalming. It was used in both Greek and roman kitchens, partly because its peppery flavor served as an alternative for pepper, which was expensive and scarce. Cumin seeds were used to pay tithes to the priests. 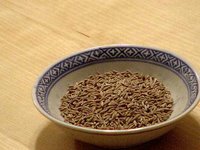 Cumin use flourished during the Middle Ages, and became recognized as a symbol of love and fidelity. In some Arab cultures, a paste made of cumin, pepper and honey was thought to have aphrodisiac properties. In Central and South America, ground cumin is commonly used in almost every beef and stew dish. Cumin has many healthy properties as well. It's high in iron and helps keep the immune system healthy. There is evidence that it has some anti-cancer properties, and it has potent free radical scavenging abilities that may have more far-reaching benefits to overall health. You can find more information on all things cumin here. While I have several recipes that call for cumin or cumin seeds, I wanted to honor the spirit of the challenge and find a new recipe. It was a challenge to find a recipe by searching for cumin, but I finally found something that looked good. I wanted to focus on the seed rather than ground cumin, so I wanted something Indian rather than Latin American. When I found this recipe for Red Kidney Bean Curry (Rajma Masala), I was happy to find that it called for both cumin seeds *and* ground cumin. It seemed perfect. There are a lot of other spices in this dish that blend extremely well with the ground cumin, but the cumin seeds, which are toasted in oil at the beginning, stand above the rest and impart their nutty bite to each mouthful. It's delicious with brown rice. 1. Asafoetida is a nasty-smelling spice that is used in Indian cooking. I only have some because the spicy eggplant stew I mentioned above calls for it and I was curious. If you don't have any or don't want to bother with it, you can omit it. Garlic is often used as a substitute and this recipe already has garlic in it. 2. I used a 14.5-oz. can of diced tomatoes instead of fresh. 3. I wasn't sure what red chili powder is, but I had regular chili powder on hand and used that. I thought about cayenne, then thought about how spicy 2 teaspoons of cayenne would be and decided the chili powder seemed more prudent. It worked for me. 4. I'm not sure what "Fry until the oil separates" means after the tomatoes are added. I just let it go until everything was cooked down, between 7-13 minutes. 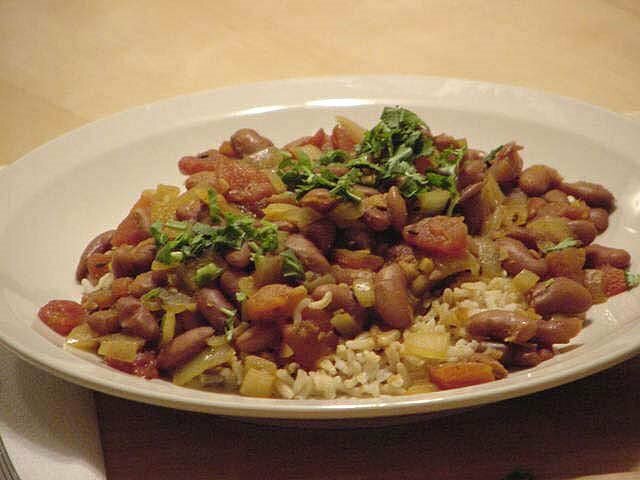 Drain the soaked red kidney beans and wash them well. Place them in a medium saucepan and cover with the water. Bring to a boil. Lower to a simmer and cook half covered, for approximately one hour or until tender. Heat the oil in a heavy-bottomed pan on medium heat and add cumin seeds and cook until the seeds begin to pop and crackle. Add the bay leaves, asafoetida and chopped ginger and garlic. Fry briefly. Add the chopped onions and fry till they are golden brown. Add the rest of the spices except the garam masala. Add the chopped tomatoes. Fry till the oil separates. Add the cooked red kidney beans along with its stock, sprinkle salt, mix well and cook on medium level for about 15 minutes. Add the garam masala. Cover and cook over medium heat for about 5 minutes. Recipe courtesy of Syvum.com. According to their homepage, they provide "Online Education, Interactive Learning and homework help to over 180 countries." I've never heard of it before, but I plan to explore it some more; it looks pretty cool. I too love cumin in bean dishes. I always add it to our Mexican style beans. This Indian style one sounds delicious. I think I neeeeeeed to try it. And yes, asafoetida really does have a pong! We keep ours tightly closed and double jarred - a small jar inside a larger jar. Who Knew It Was a Neon Fish?